You might have heard about the concept of length relativity or length contraction. Whether you are already familiar with the phenomenon of length relativity or just take your first steps in the field of special relativity, this length contraction calculator will help you to get a better understanding of relativistic effects and the length contraction equation. The length contraction is also known as Lorentz contraction. The length contraction is a relativistic phenomenon that a length of a moving object is measured shorter than its length when measured at rest. This effect is only noticeable at large velocities. The length contraction leads to a ladder paradox. The paradox involves a garage and a ladder that should be placed inside the garage. The ladder, however, is too long to fit in. The decision is to run with the ladder. From the point of view of a stationary observer, the ladder will then appear shorter and could fit in the garage. However, for a person running with the ladder, the garage is moving. Therefore its length is contracted, and it cannot fit the ladder. Who is right? happen at the same time. But whether two events occur at the same time depends on the point of view. For a person observing the scenario, these two events might happen at the same time, and this person can claim that the ladder fits in. For a person running with the ladder, these two events do not happen at the same time, and the ladder does not fit in. γ is called the Lorentz factor. 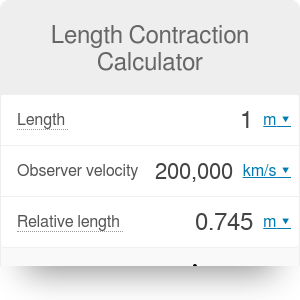 Or you can use the length contraction calculator. For the effect of length contraction to be noticeable, the speed must be very high - comparable to the speed of light. We do not have experience in our daily life with objects moving at such high velocities. This makes the effects of special relativity very counterintuitive. The effects of length contraction are difficult to observe because, additionally to the high speed required, it is difficult to measure a length of an object moving with respect to us. However, there are indirect confirmations of the length contraction. For example, the Earth is bombarded with muons which are created in the upper atmosphere from collisions of cosmic rays with atoms. Muons have an extremely short lifetime; they decay quickly into other elementary particles before they could reach the Earth's surface. However, as they move with a velocity close to the speed of light, the distance from the upper atmosphere to the Earth's surface is (for them) contracted, and we can observe muons at Earth's surface. If you want to learn about or calculate other effects of the special relativity, try our E=mc2 calculator or time dilation calculator. Length Contraction Calculator can be embedded on your website to enrich the content you wrote and make it easier for your visitors to understand your message.